Neal, Jim. "Fight for School Libraries: Student Success Depends on Them." American Libraries, 1 Mar. 2018. Immediate Past ALA President Jim Neal is on our team! ​Available in booklet format for printing as well as full-page format with internal bookmarks for desktop access, this 2018 project offers all stakeholders a visual guide to the multi-faceted skill set of certified school librarians. Please share widely! Examples of EveryLibrary work - we can ask them for help for HISD if we have a specific ask at some point. Currently, neither Board not administration can be receptive in the face of the many other more immediate solutions needed. EveryLibrary. "Save Chicago School Librarians." SaveSchoolLibrarians, EveryLibrary, 2018. EveryLibrary. "Stop The Destruction of School Libraries in the US." SaveSchoolLibrarians, EveryLibrary, 30 Jan. 2018. The American Association of School Librarians offers many advocacy resources for librarians, administrators and parents to use in the quest to improve local campus libraries. "School Libraries Transform Learning” (magazine). AASL.(Sept. 2014.) A special issue of the American Libraries Magazine devoted to school library advocacy. It is available as a downloadable PDF. Hand, Dorcas, and Debbie Hall. "Students NEED Libraries - in HISD and Every School District." Knowledge Quest, vol. 46, no. 3, Jan.-Feb. 2018, pp. 8-13. Learn how SNL came to be, and what it does. In December 2017, Leon Bolton offered on his blog a 5 part series about school libraries. He is based in the UK, but the posts are useful here as well. Check out smoe of his other posts if you have time. #1 Band, Barbara. "The Oft-Hidden Role of the School Library." Leon's Library Blog, Leon Bolton, 2 Dec. 2017. #2 Hutchinson, Elizabeth. "School Librarians and Why Our Children Need Them." Leon's Library Blog, Leon Bolton, 6 Dec. 2017. #3 Maxwell, Lucas. 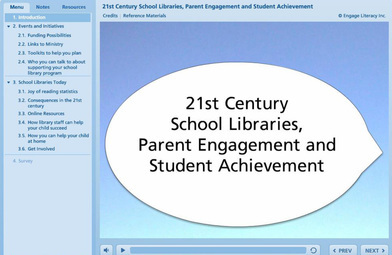 "Connecting Students with Technology in the School Library." Leon's Library Blog, Leon Bolton, 10 Dec. 2017. #4 Imrie, Matt. "Building the Reader of Tomorrow Today." Leon's Library Blog, Leon Bolton, 14 Dec. 2017. #5 Roche, Caroline. "School Librarians at Their Best!" Leon's Library Blog, Leon Bolton, 18 Dec. 2017.
before she states: "We must stand together and demand the right of every young person to have a dynamic school library that is staffed by a certified school librarian." This online tutorial comes to us from the Ontario Ministry of Education and Engage Literacy, Inc. Its Canadian roots do not diminish its usefulness here in Houston or anywhere in the US or around the world.